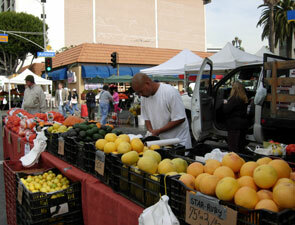 Known best for its pleasant weather, Santa Monica is gorgeous year-round. And while it may have lots of sunshine, it's also got plenty of things to see and do while enjoying it, not the least of which is its spectacular coastline. Lined with three-and-a-half miles of sun-kissed beaches and bluffs, it's the ideal place to rest and relax. More active travelers can enjoy the seashore high above the beach at Palisades Park, a 13-block stretch of palm trees and trails that offers awesome ocean views for those walking or jogging along the Pacific Ocean via Ocean Avenue. At the south end of Palisades Park is the world-famous Santa Monica Pier, where visitors can find seaside shops, an arcade, an aquarium, the Santa Monica Looff Hippodrome - a historic 1920s carousel - and several restaurants, including the Bubba Gump Shrimp Co. (301 Santa Monica Pier). 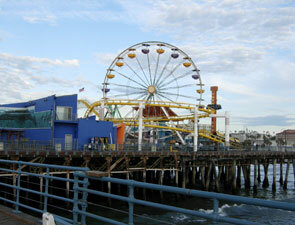 Perhaps the Pier's biggest draw, however, is Pacific Park (380 Santa Monica Pier), a family amusement park that's home to a large, ocean-adjacent Ferris wheel. For a quieter afternoon, visit the Third Street Promenade, a pedestrian-only stretch of open-air shopping that's frequented by street performers and entertainers, or one of the city's popular Farmer's Markets, the most notable being its Wednesday market (Arizona Avenue and 2nd Street), where local chefs and foodies shop - rain or shine - for fresh California produce.